The Drive offense used an 11-hit attack to dispatch Rome. At the center of the rampage was Yoan Moncada (pictured). Moncada entered the contest on a 4-for-31 skid, but the second baseman ripped a bases-clearing double in the seventh inning to supplement a walk, a hit-by-pitch, two stolen bases, and three runs scored. Mauricio Dubon was 2 for 4 with a double and walk. It was his third consecutive multi-hit game. Derek Miller and Mike Meyers also had two hits apiece. Dedgar Jimenez was the primary beneficiary of the offensive outburst. The burly right-hander allowed three runs on seven hits in five innings, striking out three without allowing a walk. Jamie Callahan was excellent in relief, throwing three shutout innings and striking out five. Greenville's win, combined with a loss by the Savannah Sand Gnats (NYM), puts them into first place in the South Atlantic League Southern Division with six games remaining in the first half. A four-run seventh inning by the Dodgers was the difference as the Red Sox fell. Eduard Bazardo turned in a strong start, allowing a run on five hits in five innings, striking out three without issuing a walk. Gary Calvo took the loss in relief, giving up four runs on three hits. Dodgers pitching limited the bats to only five hits, with Samuel Miranda's double the only one that went for extra bases. In the first game of their twin bill, the Red Sox2 squad got another quality outing from Victor Garcia. The 6-foot-4 righty tossed four scoreless innings, and has yet to allow a run in 11 frames across his first three appearances of 2015. Garcia allowed two hits, and struck out six against four walks. Victor Diaz got his second win of the year in relief, allowing a run on one hit in three innings. Stanley Espinal was 2 for 3 with a triple and run scored. Freiberg Marin also had two hits for the Sox, and Marcos Martinez added a triple. The Red Sox completed the sweep with a shutout in the makeup of Saturday's postponed contest. The team continues to get excellent pitching, with Carlos Caceres and Darwinzon Hernandez combined for the seven-inning shutout. The offense managed only five hits, but a pair of runs in the seventh provided plenty of offense. Juan Hernandez led the way, going 2 for 3 with a double. 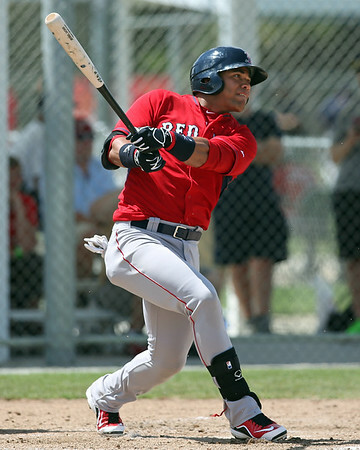 Player of the Day: The transition to minor league ball for phenom Yoan Moncada has been slow, but he showed on Monday why he is such a dynamic prospect. The 20-year old reached base three times, including a bases-clearing double in the seventh inning. Moncada also stole a pair of bases and scored three runs, helping the Drive push closer to a playoff berth.